Thanks to everyone who visited the Montbeliarde UK stand at the recent UK Dairy Expo at Carlisle. 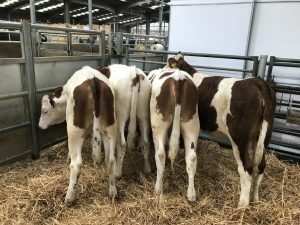 Michael Wilson from Blackcombe kindly supplied four heifers for a judging competition. The final line up was Sara from Coopex who placed them as 2641,2627,2643 and 2617. Congratulations to the three winners, Linda Wood, Fred Dent and William Wylie, prizes are on the way to them.